Napoleon Hill (October 26, 1883 November 8, 1970) was one of the first to produce literature which is geared towards providing the information needed in order to achieve personal success. This American author is thought to be one of the most talented and accomplished personal suc... read full description below. 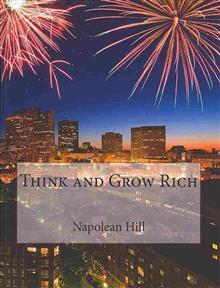 Napoleon Hill (October 26, 1883 November 8, 1970) was one of the first to produce literature which is geared towards providing the information needed in order to achieve personal success. This American author is thought to be one of the most talented and accomplished personal success focused writers, and has been thought to have provided inspiration to the highest number of people who were seeking personal success. His successful work has made him one of the best selling authors of books that provide information on personal success strategies. For 25 years, Hill outmatched the competition in his efforts to educate individuals on the reasons why financial success and life long prosperity are not achieved by so many people around the world. Think and Grow Rich is one of Hill's most accomplished books and considered to be one of the best performing, best selling books in the industry. Hill's books helped to provide insight as to how personal beliefs can greatly influence personal success in one's life. Hill created literature that focused on the strategies that could be implemented to help even the average person achieve final freedom and life long personal achievement.